Are wild horses icons of the West or an invasive species? The pinto stallion balanced on his hind legs, striking the air like something out of The Black Stallion, one of my favourite childhood novels. ‘He must be the one who’s been leaving those stud piles,’ my co-worker said. Studs, intact male horses, mark their territory with large mounds of manure. We had been spotting them along the road for hours as we scoured rocky ridges for artefacts. Returning his front limbs to the ground, the mustang towered over the sprawling landscape. He snorted in our direction, white-rimmed nostrils flared, multi-hued mane and tail whipping in Wyoming’s notorious wind. Nearly a decade ago, during the summer of 2006, I worked as an archaeological technician for the United States Bureau of Land Management (BLM). Mostly that meant I built fences for ranchers, hauling materials up and down the Cowboy State’s sage-strewn hills. We constructed ‘wildlife friendly’ fences that allowed antelope to pass through while blocking the movement of horses and cattle. Other days I roamed the high desert with my colleagues in search of relics, from arrowheads to wagon ruts. On that particular afternoon, we were looking for ‘medicine wheels’, stone circles used in Native American spiritual rituals throughout Alberta in Canada and in the northern United States. What we found was a symbol of freedom, a living icon of the American West, one whose preservation is increasingly controversial. The BLM is tasked with protecting US mustangs and burros under The Wild Free-Roaming Horses and Burro Act of 1971. However, the organisation also manages and conserves land under a ‘mandate of multiple-use and sustained yield’. In the 10 western states inhabited by mustangs, fewer than 60,000 wild equines compete with roughly 700,000 ‘animal units’. An animal unit, consisting of one horse, one calf/cow pair, or five sheep, is a measure used to calculate foraging needs across species. The BLM has reduced domestic livestock grazing by a third since 1971, but wild horses have lost 41 per cent of their land in the same period. 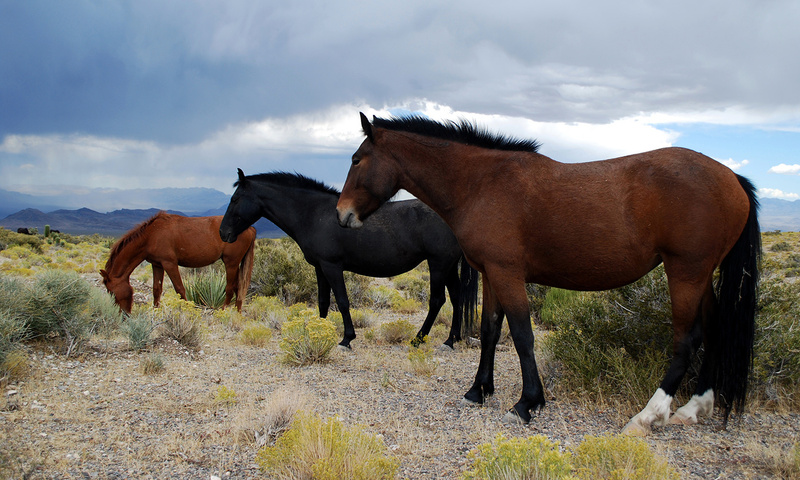 In fact, mustangs and burros are allowed access to only about 17 per cent of BLM’s 155 million acres of grazing land. As equine herds grow, they outstrip limited resources and, to avoid thirst and starvation, they encroach on the areas designated for livestock. Outside of their safe-zones, the horses may be rounded up by the BLM and placed in holding facilities. For 31,228 mustangs and burros, those facilities offer pasture. But 16,400 more horses and burros have landed in short-term corrals that can be cramped and inhumane. In some instances, activists have documented cases of horses living in knee-deep mud and manure. And with limited resources and too many horses in captivity, the BLM cannot adequately vet or follow up with buyers. Between 2008 and 2012, Tom Davis, a Colorado rancher, adopted 1,794 off-range mustangs from BLM, 1,700 of which he illegally sold to slaughter. But the last US equine slaughterhouse had effectively closed in 2007. To get around this, Davis transported the horses to Mexico, a process widely accepted as traumatic for the sensitive animals. US policy and beliefs about horse slaughter for human consumption are convoluted and controversial. However, it’s been illegal to sell wild horses bought through the BLM programme to slaughter since 1971. In recent years, a simmering conflict between fans of wild horses and public land ranchers has surfaced. Ranchers and some ecologists call for increased removal of the mustangs, which they claim are invasive and thus damage the land – these, after all, are direct descendants of Spanish warhorses, not the smaller beasts that originally evolved and later went extinct on the continent. Equine advocates, in turn, lean hard on the animals’ iconic status as justification for their preservation. A few studies do indicate that unmanaged horse populations can negatively affect the West’s semi-arid and arid ecosystems. However, the Center for Biological Diversity blames cattle and their huge numbers for most of the region’s environmental degradation. In addition to destroying native vegetation and contaminating water sources, protecting cattle and sheep has led to the extinction of several keystone predators, including grizzly bears and the Mexican gray wolf (animals that could help control wild-horse populations). Furthermore, the meat industry is increasingly recognised as a major driver of climate change, with factors such as manure storage and ruminants’ enteric emissions underpinning 14.5 per cent of global emissions. Cattle account for nearly two-thirds of that. Ranchers, the BLM and ecologists tend to focus on reducing the number of horses. Some propose encouraging the consumption of horse meat or facilitating culling operations. Dart-administered birth control, though promising, is costly and time-consuming. A more responsible fix challenges the notion that cattle have more rights to the land than the horses do. Thus, while this isn’t a call to abolish livestock-ranching or meat-eating nationwide, removing food animals – especially cattle – from BLM land could provide benefits that extend beyond the horses. Disallowing public grazing of food livestock would leave greater space for mustangs to roam, allowing them to move through their landscapes more naturally. This would temporarily spread their impact, reducing the potential for damage. Meanwhile, the simplified environment would open opportunities for more conclusive scientific study. Current data shows an overlap between cattle and horse effects on the environment. Fewer cattle would better allow researchers to examine whether and to what extent horses actually overgraze land and drive wild ruminants off preferred foliage. Furthermore, without livestock herds to protect, the reintroduction of natural predators might allow an ecologically sustainable balance to emerge. There is potential for economic benefit as well. Since grazing on BLM land is subsidised – the Center for Biological Diversity found that federal grazing programmes cost approximately $125 million in 2014 – removing livestock would save taxpayers money. And because these subsidised ranches provide less than 3 per cent of the nation’s beef, the change wouldn’t decimate the cattle industry. Finally, keeping wild horses and burros in holding facilities costs an estimated $49 million annually. By providing the space for more horses to roam while developing better overall range-management strategies, this expense could be drastically reduced. The wild horses of the US have overrun the land allotted to them. But in calling for solutions that reduce the number of equids, we pick the low-hanging fruit, missing the opportunity to address deeper questions. Perhaps it’s time to ask ourselves why we want cattle – especially given their massive carbon footprint – to have so much right to our wide open spaces?